Tamil Nadu is a bustling state in Southern India. There’s many tourist places to visit in Tamil Nadu such as the big cities of Chennai, Pondicherry and Madurai and plenty of famous temples. It’s not just the cities in Tamil Nadu that are worth visiting however. There’s plenty of off-the-beaten track gems where you’ll get to try amazing food, see incredible scenery and experience the warmth of the Tamil Nadu locals. You could literally spend weeks exploring this part of India, but here are just some of the highlights and recommendations of things to do in Tamil Nadu if you have a week or so. Madurai is the second largest city in Tamil Nadu and is well worth a visit. It’s a big city but without being totally overwhelming like some of the northern cities. 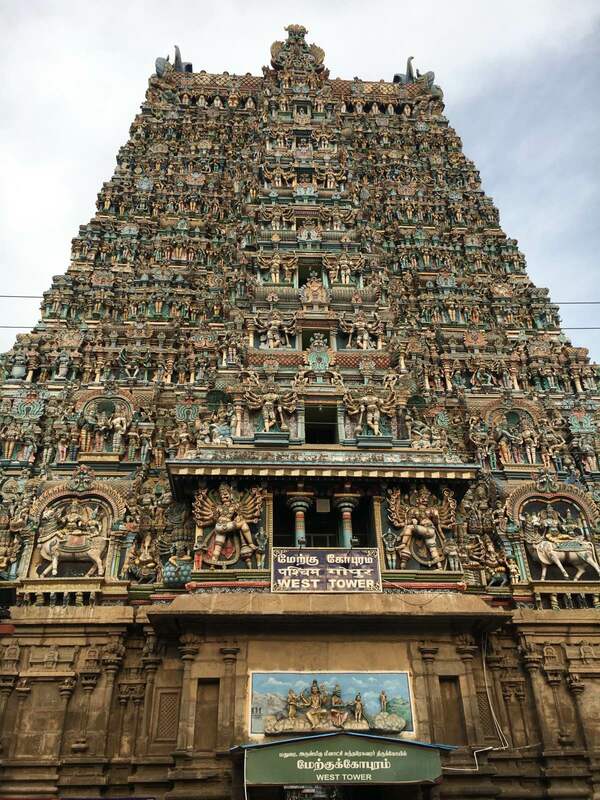 The number one thing to do in Madurai is visit the impressive Sri Meenakshi Temple complex. Dating back to early AD it has 14 towers, with the tallest at almost 52 metres high. They’re each covered with thousands of colourful stone figures of animals, gods and demons.There’s an estimated 33,000 sculptures in the complex! The temple is dedicated to Meenakshi, a form of Pavarti and Sundereswar, a form of Shiva. 15,000 people per day pay to visit their respects, rising to 25,000 on Fridays, so pick your visit time! You’ve likely heard of Bollywood, but Kollywood is the term for Tamil films made in Chennai and features Tamil characters as the heroes. It’s a great experience to visit the cinema in India – the locals get right into the films and boo, hiss and cheer at appropriate points! The grand Victoria Edward Hall cinema in Madurai! It’s dirt cheap as well – 130 rupees ($2 USD) when we visited during the day. At the start of the movie the National Anthem is played and everyone stands. We saw the film Mersal which has caused much controversy in India with its ‘tell it like it is’ social messaging about current events – the corporatisation of hospitals, introduction of GST and demonetisation (removal of 1,000 rupee notes overnight which has caused many to lose their life savings). If that all sounds a bit heavy, be reassured that there was plenty of singing, dancing and action. I actually really enjoyed the film, it was incredibly powerful and a great experience. When it was suggested we do this I was pretty adamant I wasn’t going to take a rickshaw ride, to me it seemed like exploitation and after reading some haunting novels about the life of rickshaw drivers in India – pretty damn grim. However it was explained to us that it’s important to support these people, they live hand to mouth and if tourists don’t utilise their services they and their families will literally starve. All of the guys are saving money to purchase a tuk-tuk, so giving them a generous tip will certainly help them along the way. 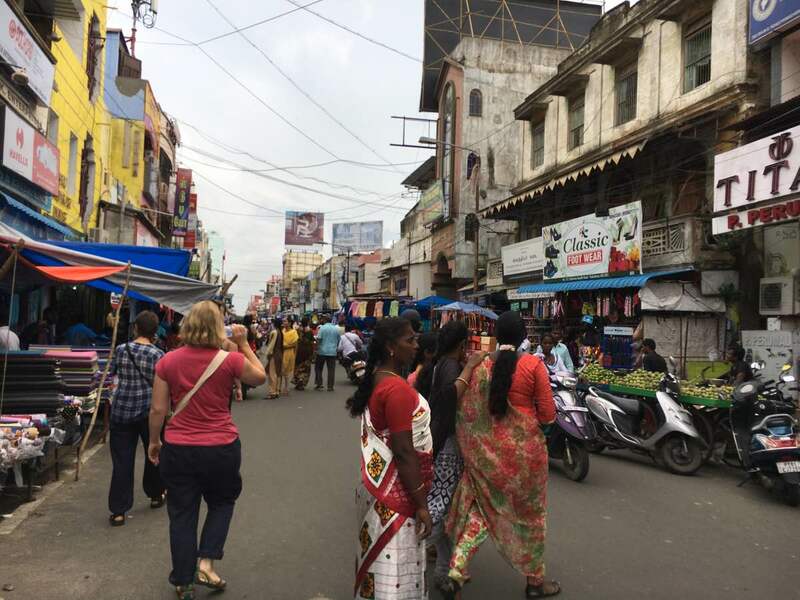 So we set out at dawn and headed down to the streets of Madurai market, and it’s one of the best markets I’ve EVER visited. 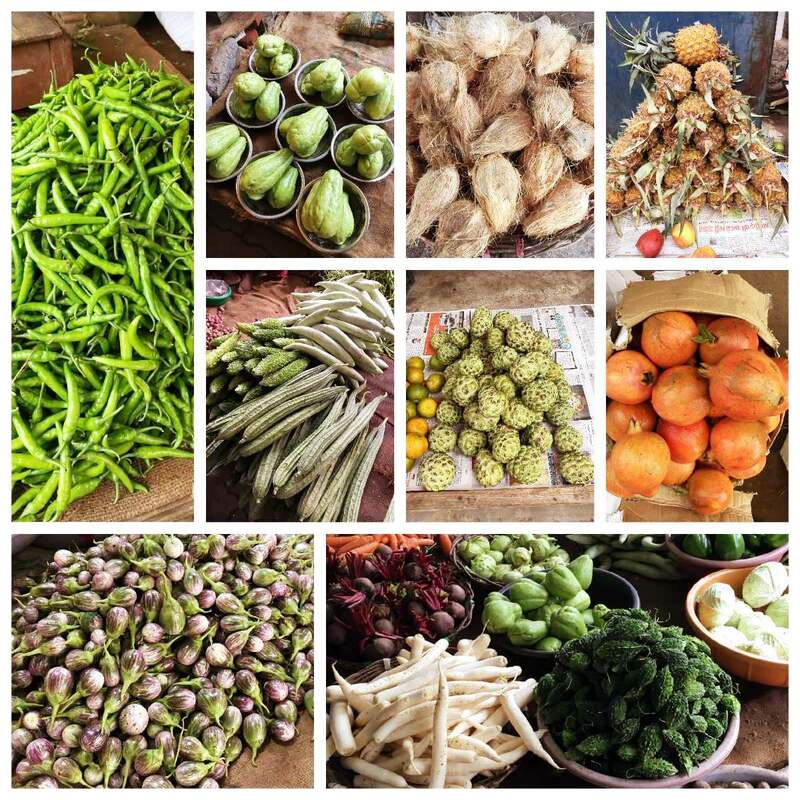 Various streets are dedicated to particular produce, so you see the wholesale markets first – chilli street, onion street, banana street and so on. Then it all comes together into one produce market. 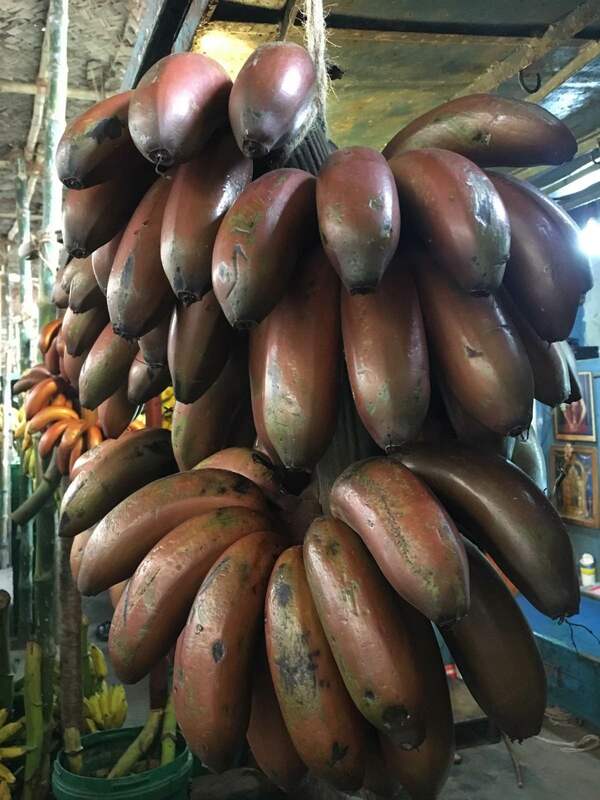 Beautiful Red Bananas. I’ve never seen these anywhere before and they were delicious! The reason I liked it so much is it was a totally authentic experience. We saw no other tourists and there were no souvenir shops anywhere – just hundreds of people going about their daily shopping routine. And the produce was absolutely amazing! The people were so friendly also, and genuinely interested and happy to see us there. We asked before taking photos and then showed it back to them on the screen and their smiles were amazing. Note: in many of these photos the people aren’t smiling, but that’s because particularly the older generation adopt a very formal serious face when you ask to take their photo. 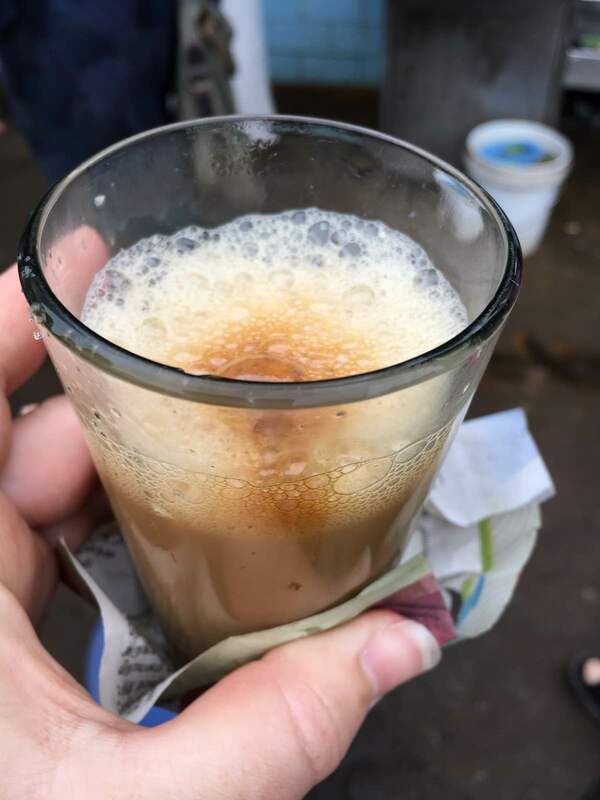 We also got to enjoy one of the best coffees I’ve ever tried and one of the many non-descript coffee houses around – all for the princely sum of 20 rupees (around 30 US cents). 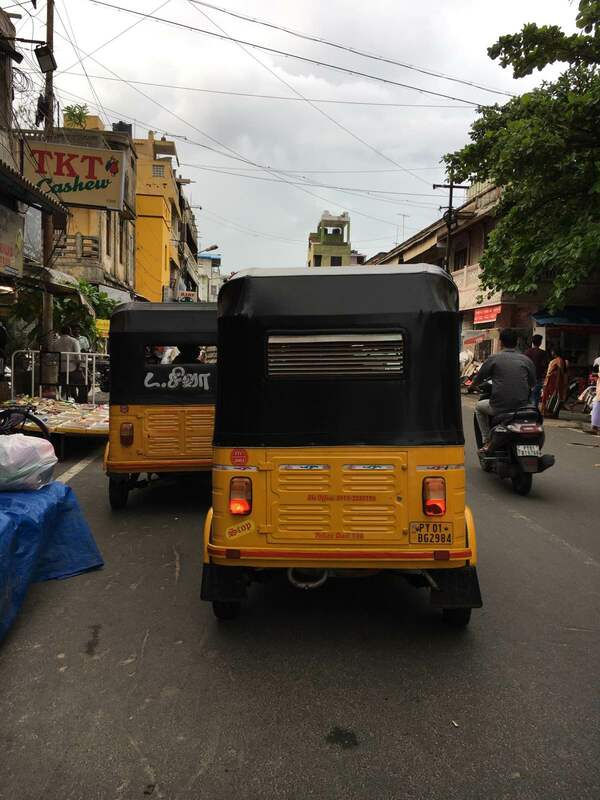 I’d highly recommend doing a market tour if you’re in Madurai, and I promised the rickshaw driver I would put his details on my website, which will help him to buy his tuk-tuk so please get in touch with him and give him a generous tip! A street food tour is a fabulous way to try all the delicious looking food of an area without worrying about whether it is safe to eat. 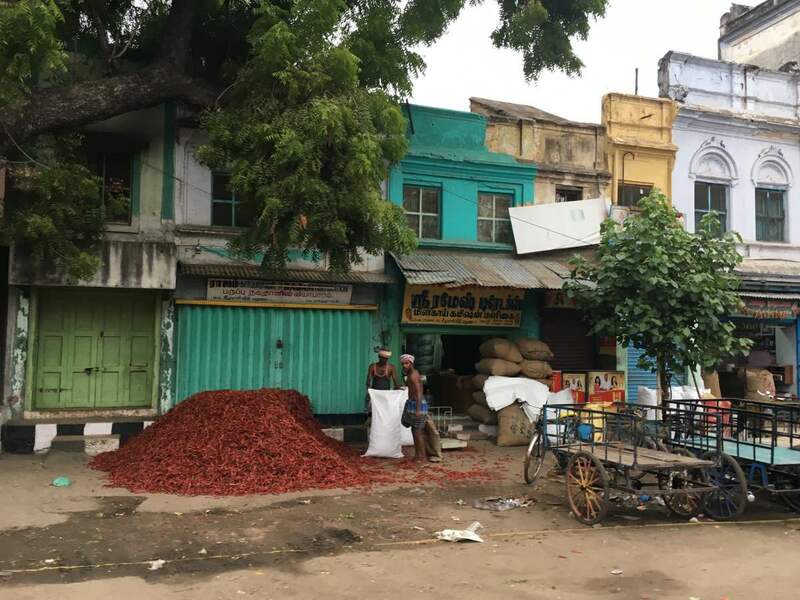 We did a great food tour in Madurai, however the food was a little more challenging than what I’ve had in other places – mutton (goat) brains and cottonseed oil drink anyone?! I’ll write a separate post on the food of Southern India with all the details as it’s too much to enter here! 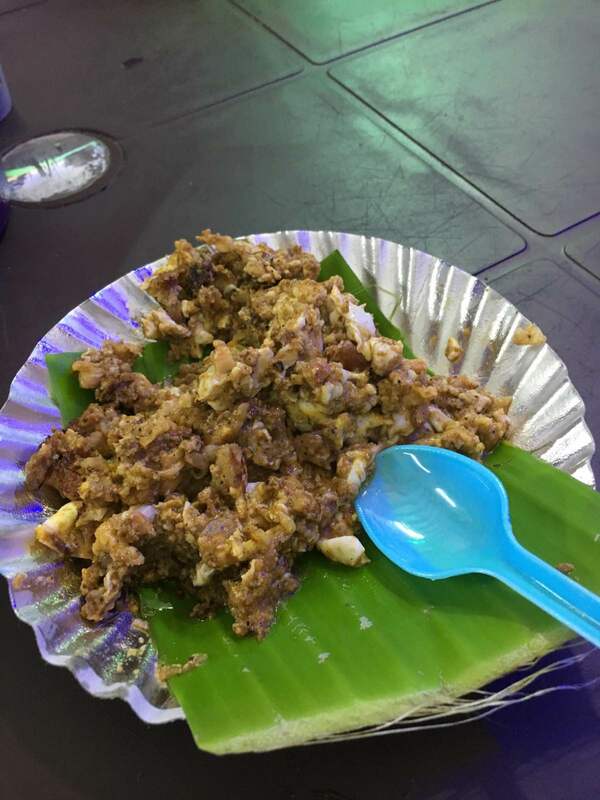 Mutton (goats) brains mixed with egg! 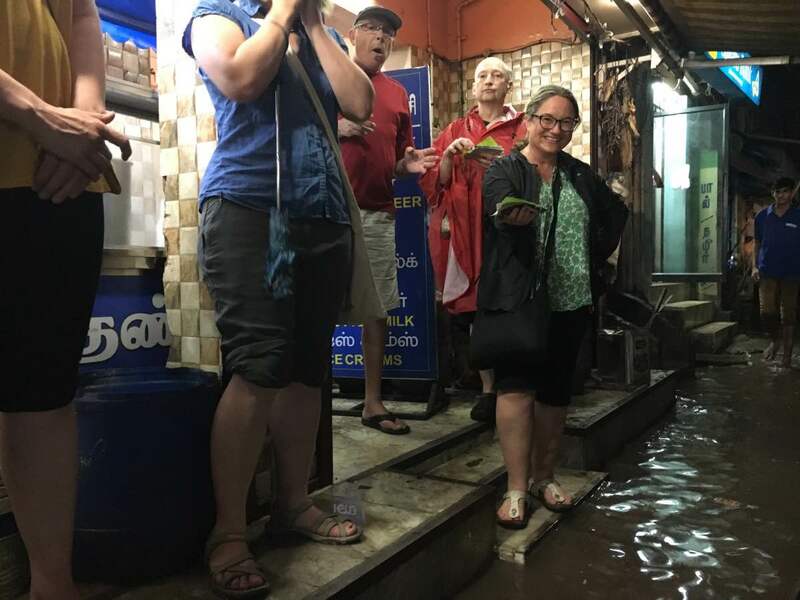 The one small mishap along the way was a torrential downpour that flooded the streets when we were in one of the restaurants. We were effectively marooned and there was no choice but to wade through the almost knee high (for my short stature!) water. If you’ve been to India you’ll know you spend a large portion of your day dodging cow, dog, human excrement, rubbish and who even knows what else. To then wade through it is extremely challenging! It’s all part of travelling in India though, you have to expect the unexpected and go with it. It made me INCREDIBLY thankful that I’ve invested all that money over the years on protective vaccinations. I did end up sacrificing my 25+ country pair of travel Birkenstocks however – the filthy water had penetrated right through the cork and I didn’t want to experience the smell once they had dried out! One of five Gandhi museums in India, this is reportedly one of the better ones. Unfortunately I didn’t have time to visit, but I’ve heard good reviews. 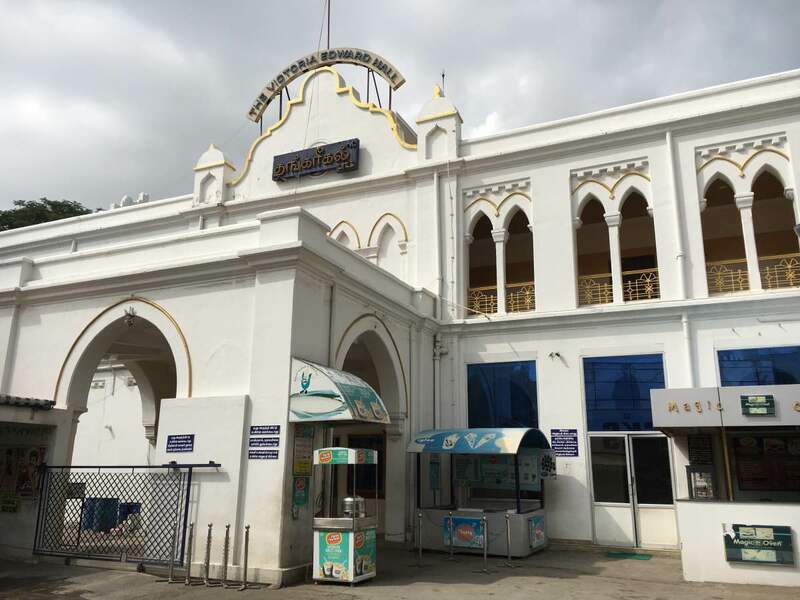 Some of the exhibits include 100 original Gandhi artefacts and an visual biography including photographs, paintings, quotations and copies of correspondence. 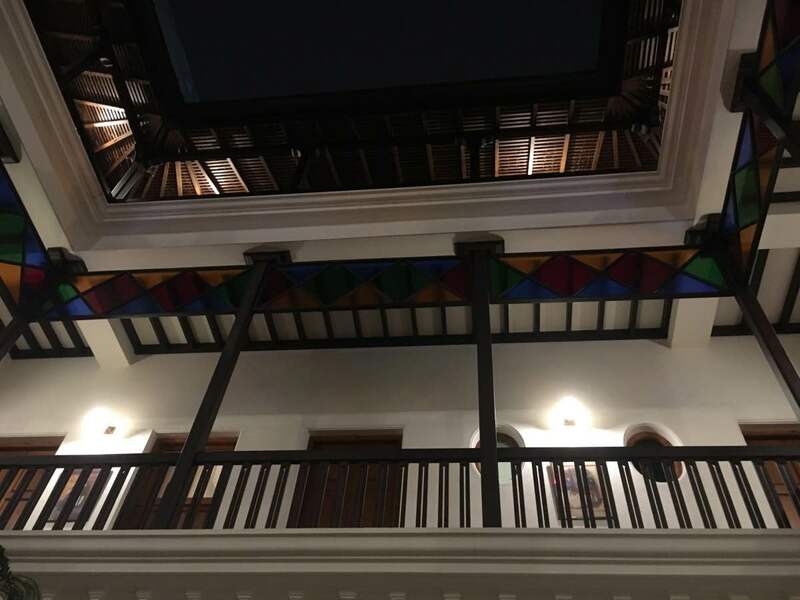 I stayed at the Madurai Residency which was excellent and it had a wonderful rooftop restaurant that served fabulous food. 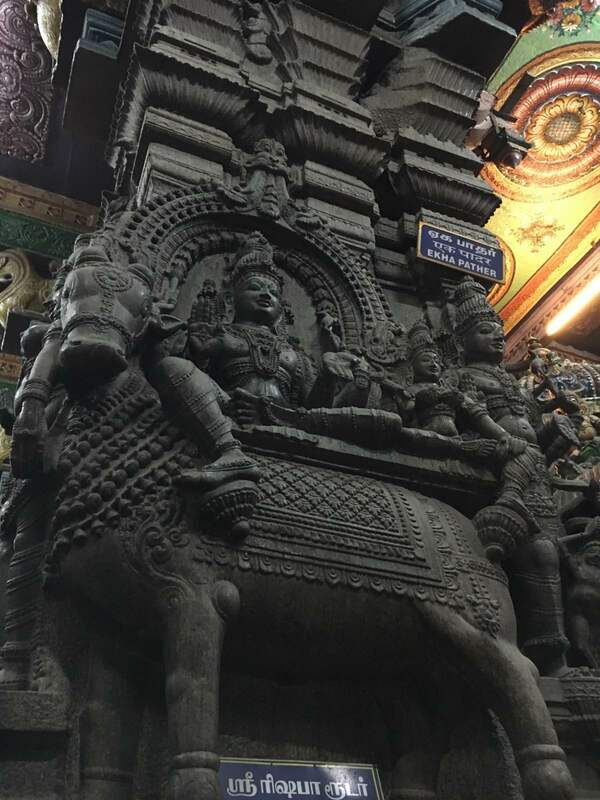 It was in a great location with easy walking distance to the Sri Meenakshi Temple complex. 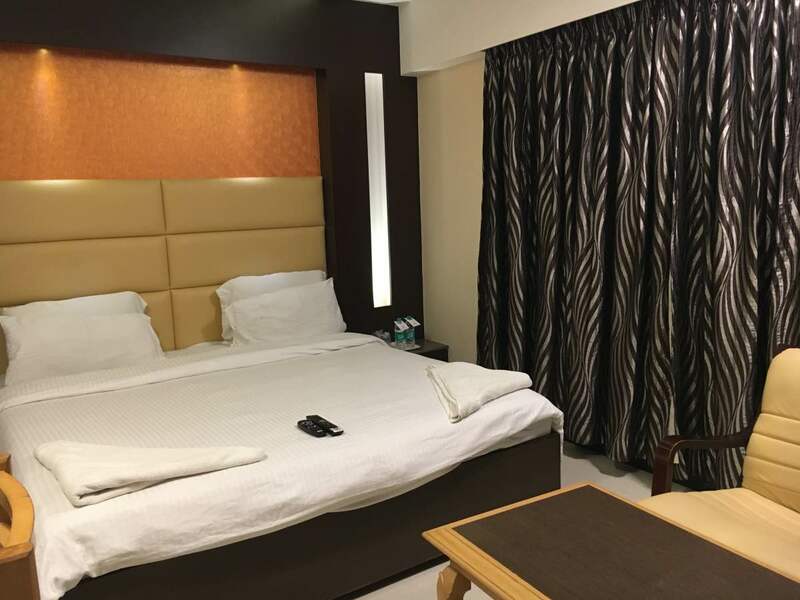 Check prices and book the Madurai Residency here. 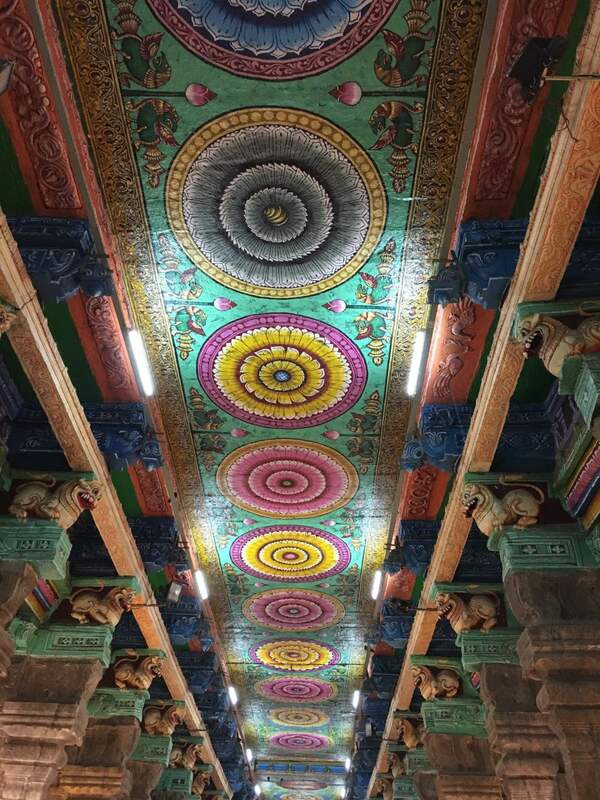 Mid-range: Madurai Kolam – this lovely homestay is close to Sri Meenakshi Temples and a great roof terrace. They also have a bicycle rental service! 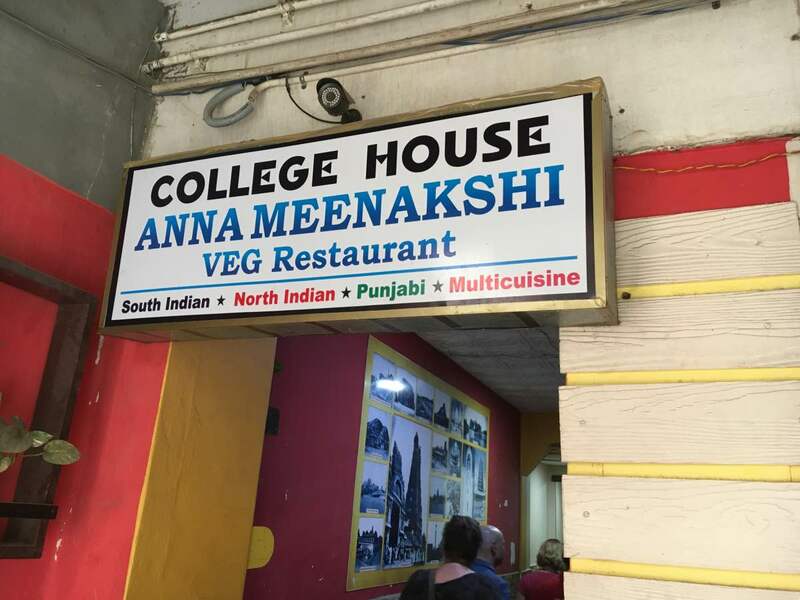 If you’re looking for a completely authentic Southern Indian thali experience, then be sure to visit the Anna Meenakshi restaurant at New College House in Madurai. 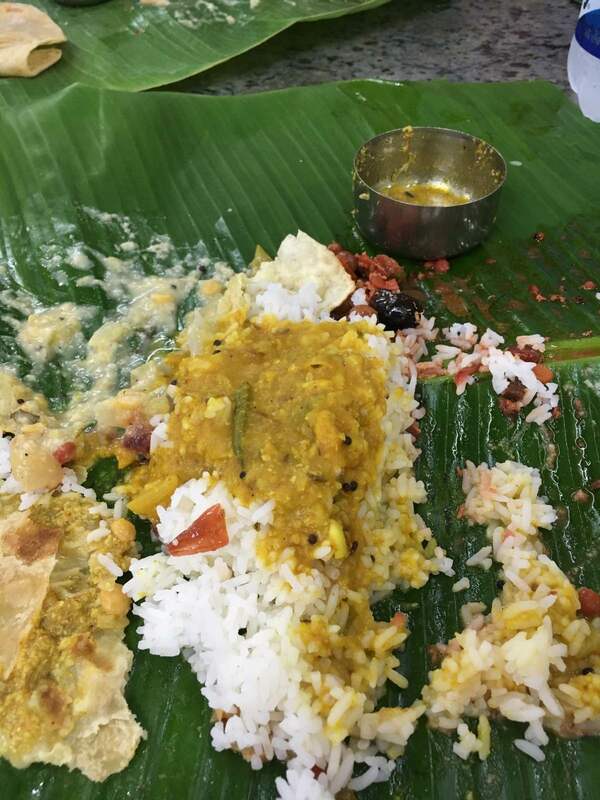 The vegetarian thali was absolutely delicious and served the traditional way on a banana leaf straight from the tins. A must do. 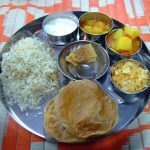 The thali is served from these dishes. For a more slightly upmarket dining experience (but still excellent value) then the rooftop restaurant at Madurai Residency hotel was great. The views at night over the city are stunning. It’s also a great place to try some of the local Chettinad style dishes. 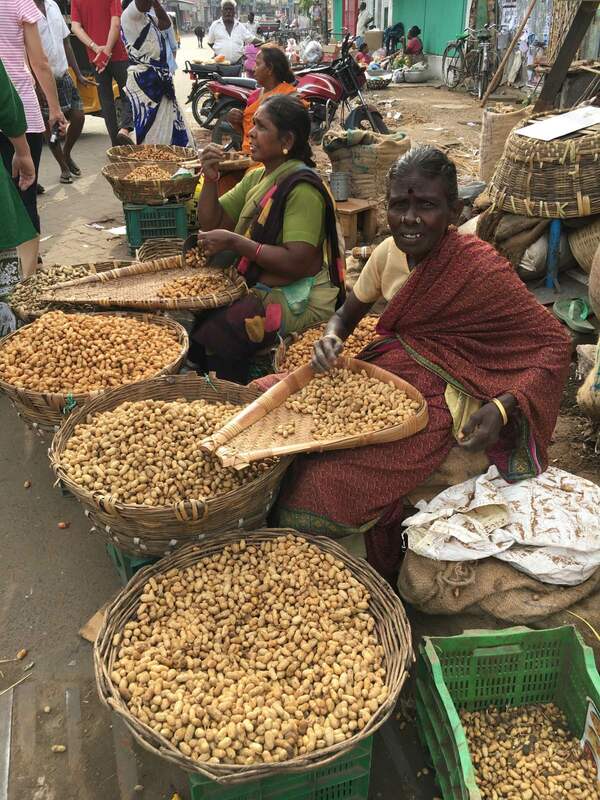 Pondicherry is technically not in Tamil Nadu itself as it is part of the union state of Pudicherry. However it’s surrounded by Tamil Nadu and one of the main cities to visit in the area. 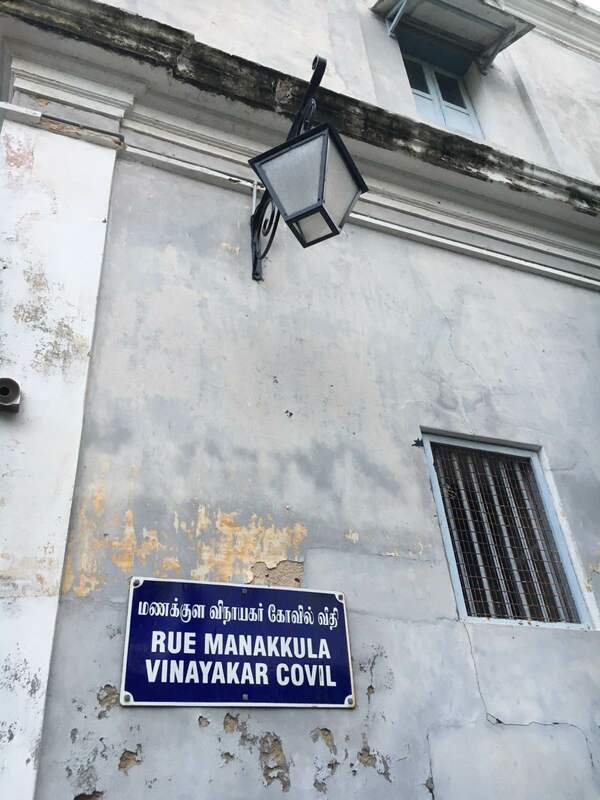 It has a strong French heritage – so much that many of the inhabitants of Pondicherry hold French citizenship. 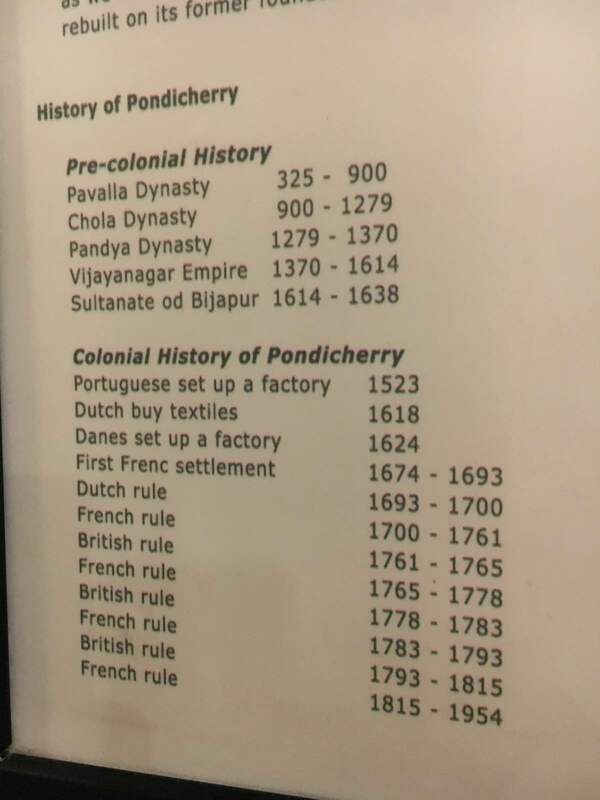 But as you can see, the history of Pondicherry is complicated! A brief history of Pondicherry! Many of the colonial style buildings are very European style and the street names are called ‘Rue’ and are wide boulevard style. You could almost be in France! 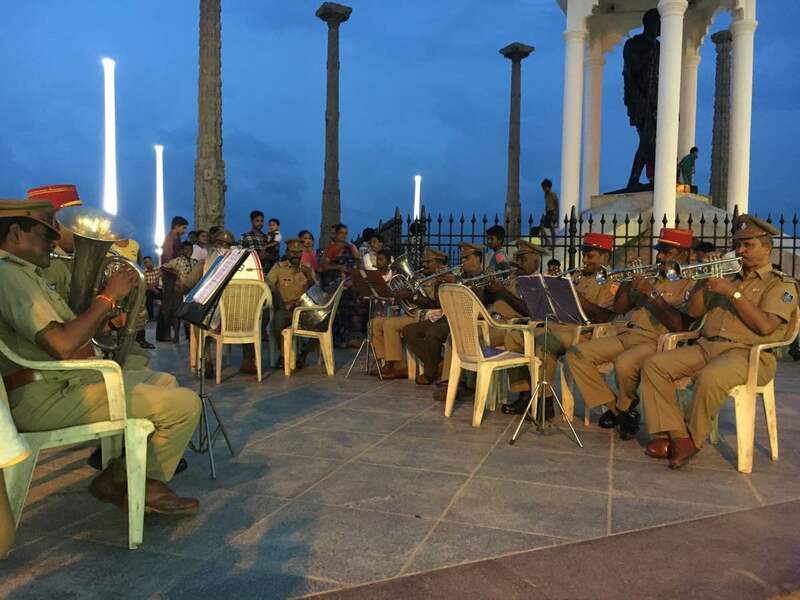 The police of the area wear a distinctive red hat – known as ‘fish curry bowls’ by the Northern Indians in reference to the food of the area. Speaking of food – the French have certainly left their mark here also. There are numerous French bakeries selling delicious patisserie, croissant, pan au chocolate and excellent coffee! 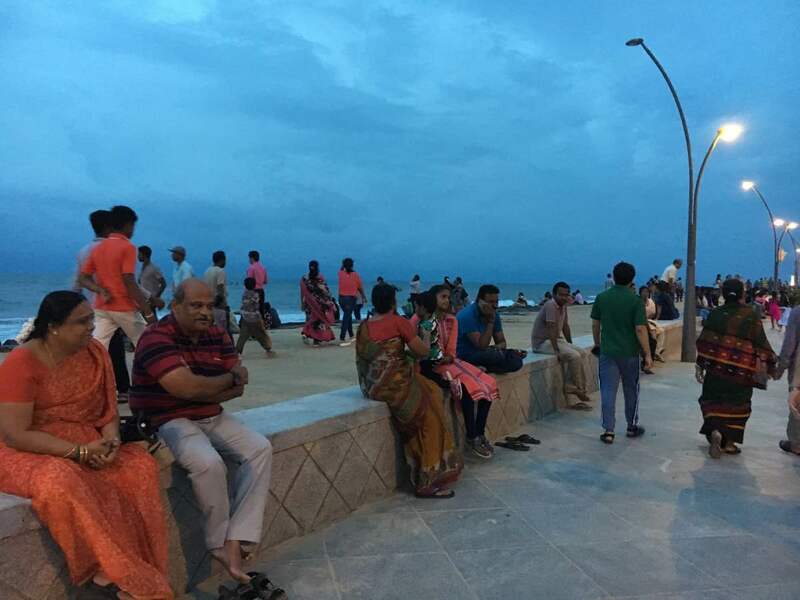 Pondicherry Beach has a great promenade which comes to life particularly in the evenings when the locals come out to stroll along and socialise. The evening we were there the police band were playing which created a wonderful ambience. This incredible temple is dedicated to Lord Ganesha, and has the most beautiful wall paintings inside. 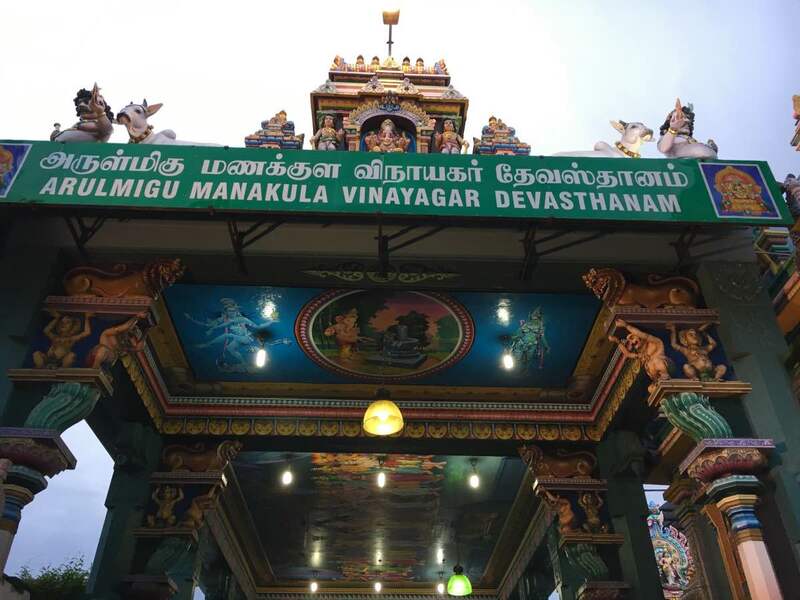 Non-Hindu can visit but dress modestly and remove your shoes upon entering. Eight kilometres from Pondicherry is the experimental town of Auroville. It’s a kind of humanity utopia which aims to be a universal town where people from all countries can live together in harmony regardless of ethnicity or religion. Around 2,500 people from 49 countries currently live at Auroville, and the town was inaugurated in 1968. At the heart of the complex is the striking Matrimandir – a giant golden globe that’s used for meditation and concentration. 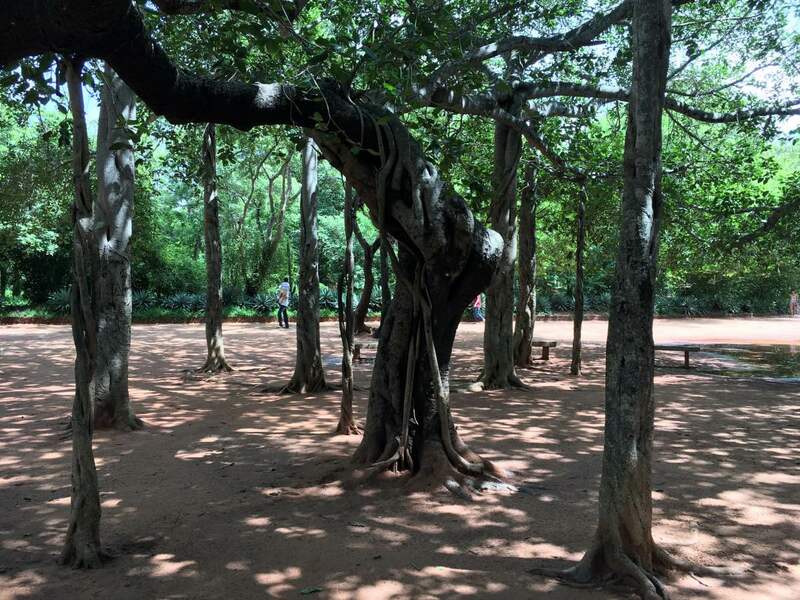 It’s a fascinating place to visit and wander amongst the beautiful gardens all planted by the inhabitants of Auroville. There’s also an excellent cafe that does beautiful organic food, and some lovely boutiques and shops selling handmade clothing, jewellery, soaps, books and other trinkets. 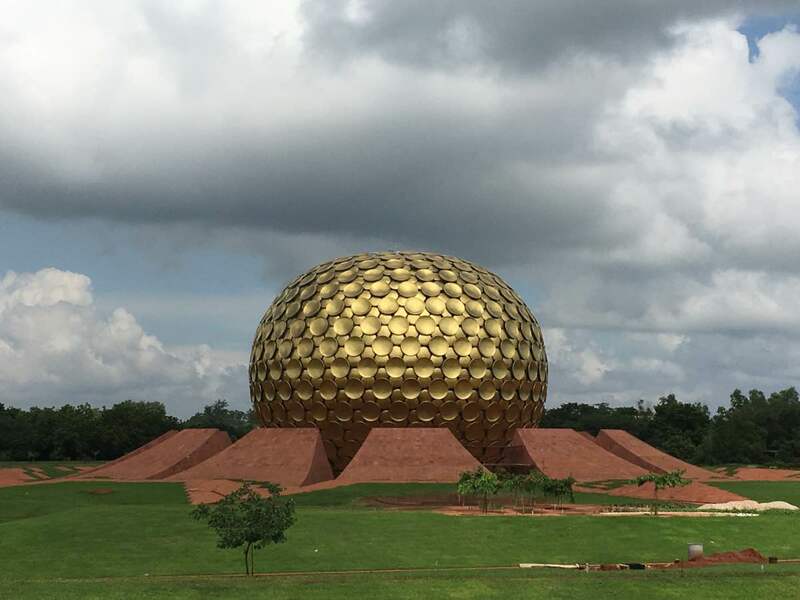 Learn more about Auroville here. 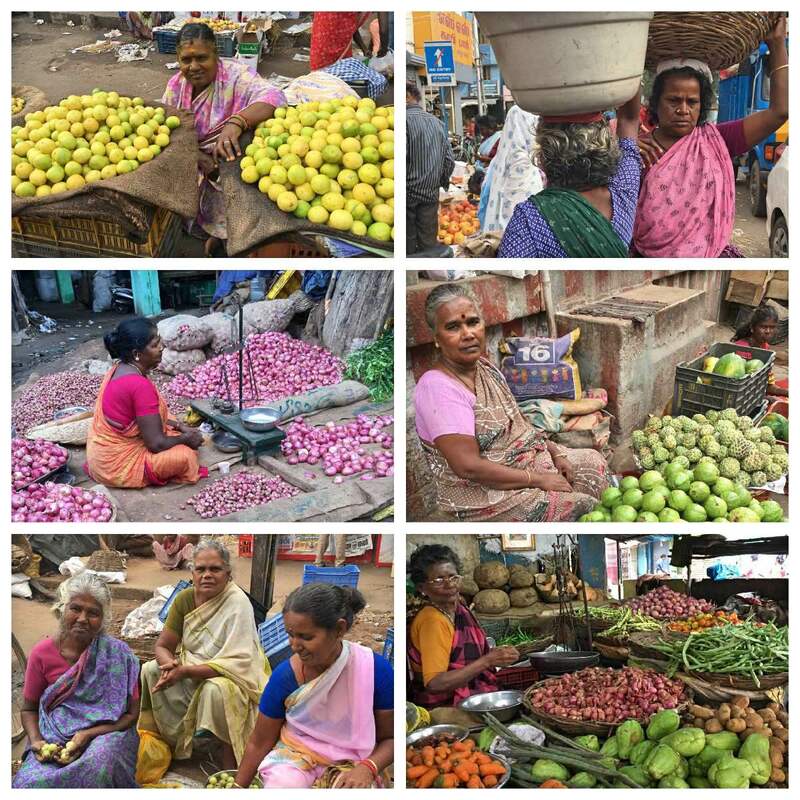 This is India at it’s authentic finest – the incredible Goubert market on Nehru Street. 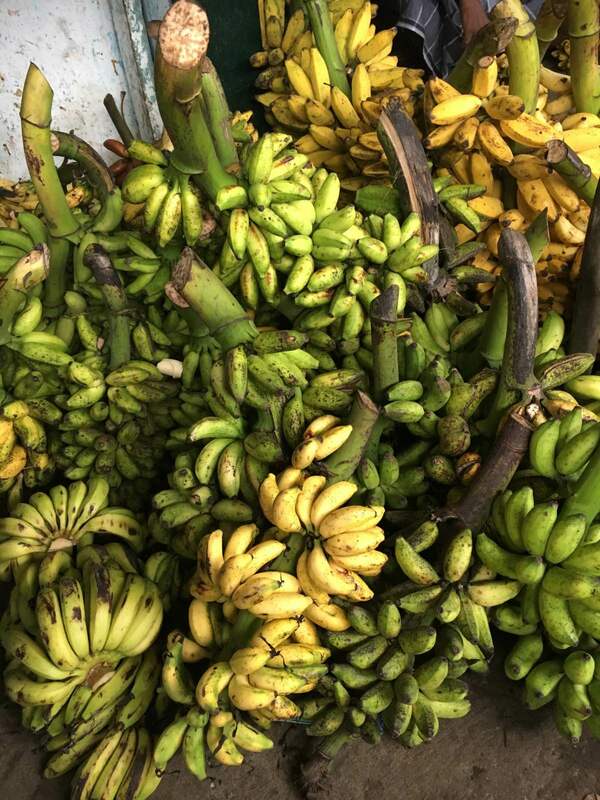 It’s such a great place to wander through the streets, watching life in action and seeing all the fruit, vegetables, clothing and bric-a-brac for sale. It does get very crowded but the atmosphere is very friendly and we felt very safe at all times. I stayed at the mid-range Hotel Suguru in Pondicherry. 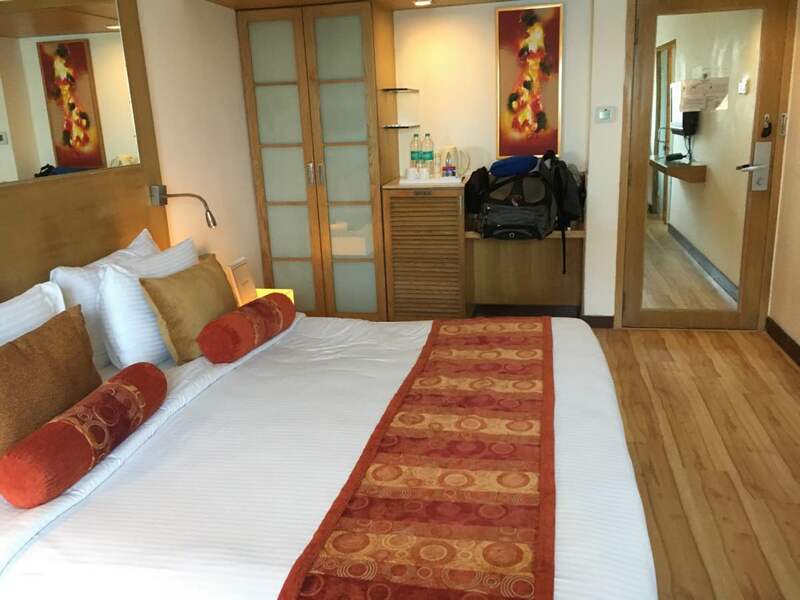 The room was very clean, the bed comfortable and the bathroom was very large. Where I really would have loved to stay is where we had an evening cooking class and dinner at Maison Perumal. This stunning Chettinar style mansion is over 130 years old and has been beautifully restored. If you want to splurge, this would be the place! Check out prices and book Maison Perumal here. Budget: Aadhaar Guest House – another great homestay option with a lovely roof terrace and many repeat visitors! 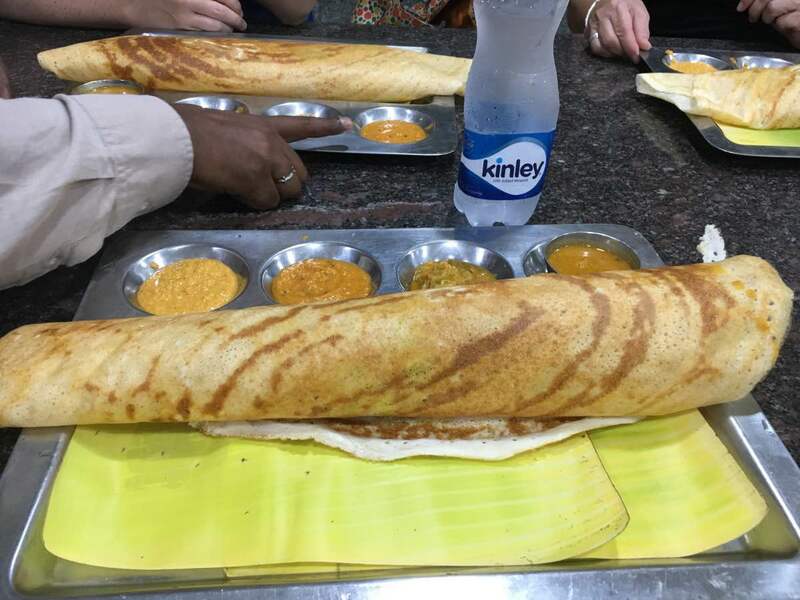 Pondicherry is all about the food! Because of the French heritage, the food in Pondicherry is a real mix of Franco/Indian cuisine. I adored the food here! Indian Coffee House on Nehru Street is an institution and features at the start of the amazing book ‘The Life of Pi’. 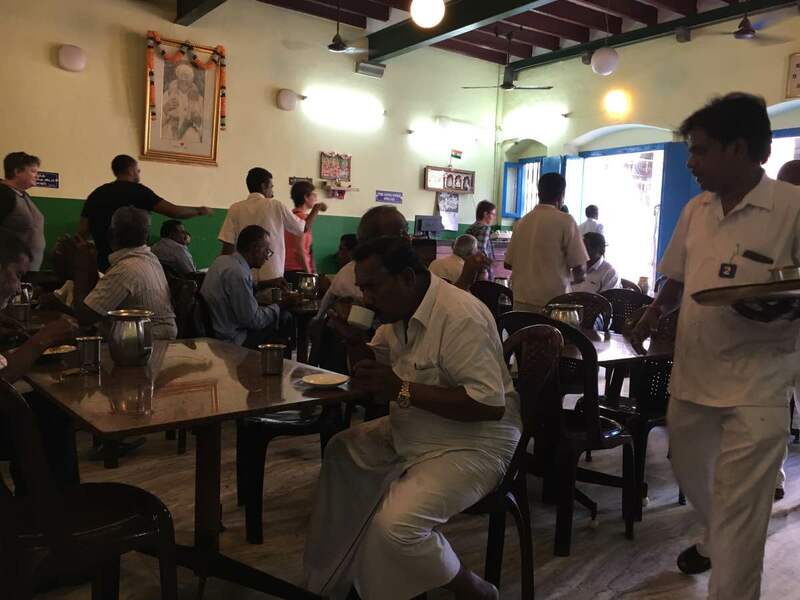 I loved our breakfast here of puri, sambar, oothapam and fabulous coffee. A must do. When in Pondicherry it’s perfectly acceptable to eat French food, and we had a great meal at Satsanga French and Italian restaurant. Even more so, you can get a great beef steak with a mushroom, wine and cream sauce (which it’s perfectly acceptable to do in the Dravidian culture as well, so don’t feel guilty!). The chicken liver pate starter was divine, and fig ice-cream to finish was delicious – no photos sorry as I was too busy eating! As mentioned above this hotel is divine, and the food is also great. 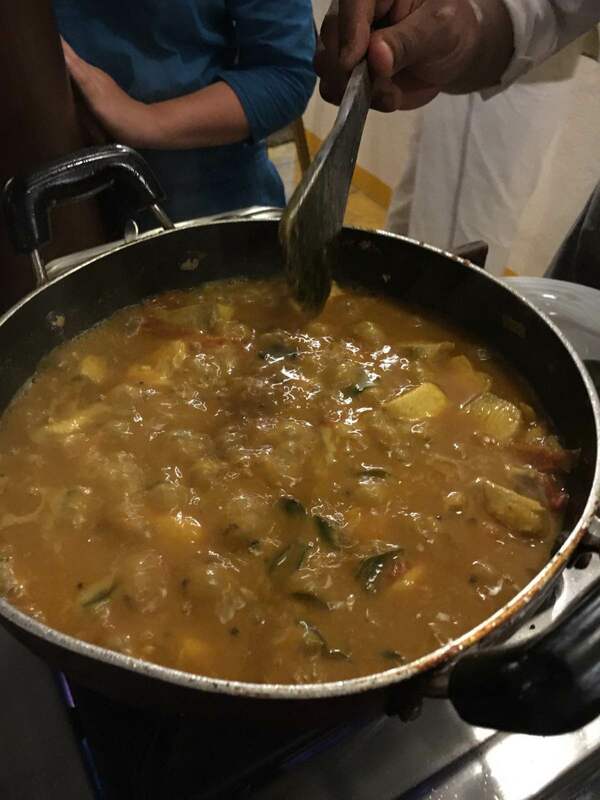 We started with a cooking lesson of traditional Chettinad cuisine, by the restaurant chef Mr Robert William. This was followed by a beautiful dinner cooked by the hotel chef. Highly recommended. This cafe at the Visitor Centre at Auroville has the most beautiful fresh food, grown where possible in the gardens at Auroville. I had a lovely mushroom tart and a beautiful fresh salad which is a luxury in India (food hygiene is taken very seriously at this restaurant and everything is washed in bottled water so no worries about getting sick!) The iced coffee is the best I’ve ever had. 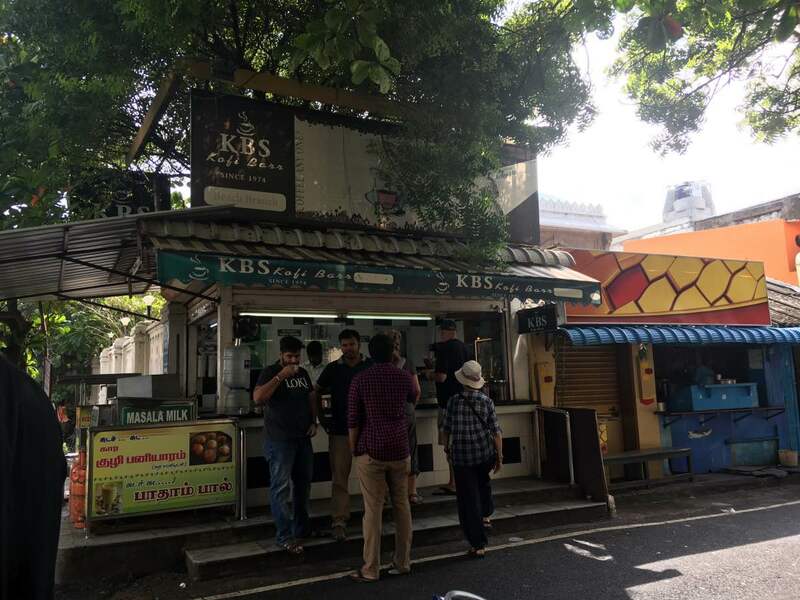 The KBS coffee stall has been around since 1974 and makes the most wonderful coffee, the best I had in Pondicherry! 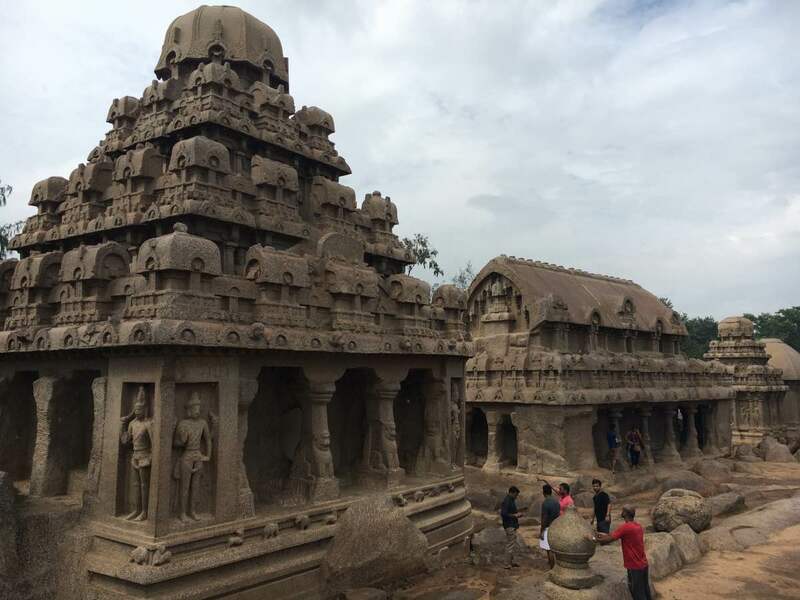 Mamallapuram (also known as Mahabalipuram) is a good halfway point between Chennai and Pondicherry, and home to some incredible heritage temples. 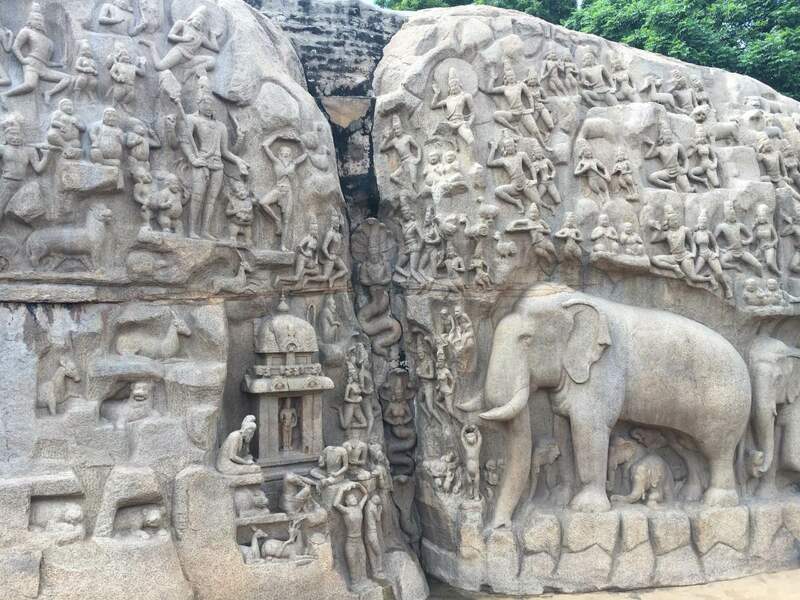 Mamallapuram is home to the UNESCO heritage shore temple, constructed in the 8th century. It’s thought that it was one of the legendary Seven Pagodas and the only one remains on land – the rest have succumbed to erosion into the sea. 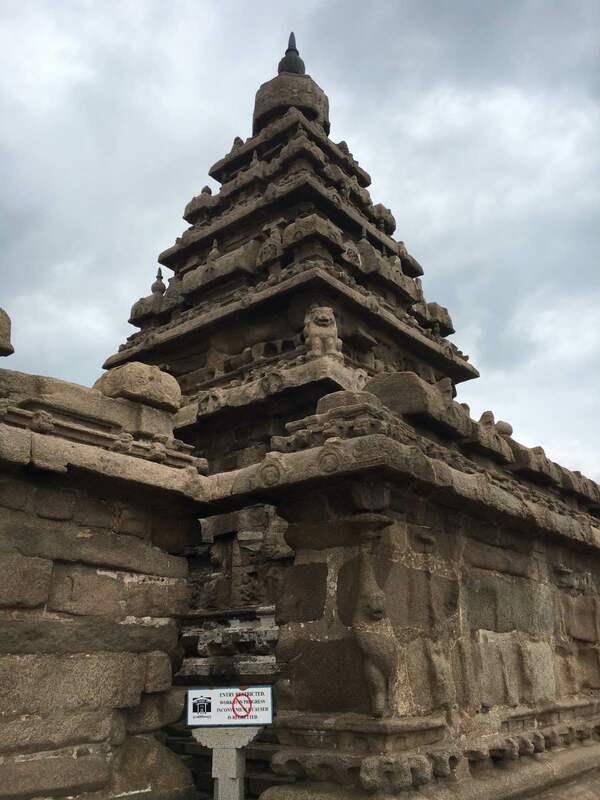 The Shore Temple is incredibly reminiscent of Angkor Wat in Cambodia – the style of temples and carvings are remarkably similar. If you visit in December/January be sure to check out the Mamallapuram Indian Dance Festival which takes place next door to the Shore Temple. The Ratha Temples are another stunning temple complex, and the most famous five in the complex are dedicated to deities in the Shiva, Vishnu and Durga traditions of Hinduism. The Descent of the Ganges is the largest rock relief carving in the area and is simply incredible. They date back to the 7th century and are scenes from Hindu mythology, carved on two granite boulders of 27 metres long and 9 metres high. 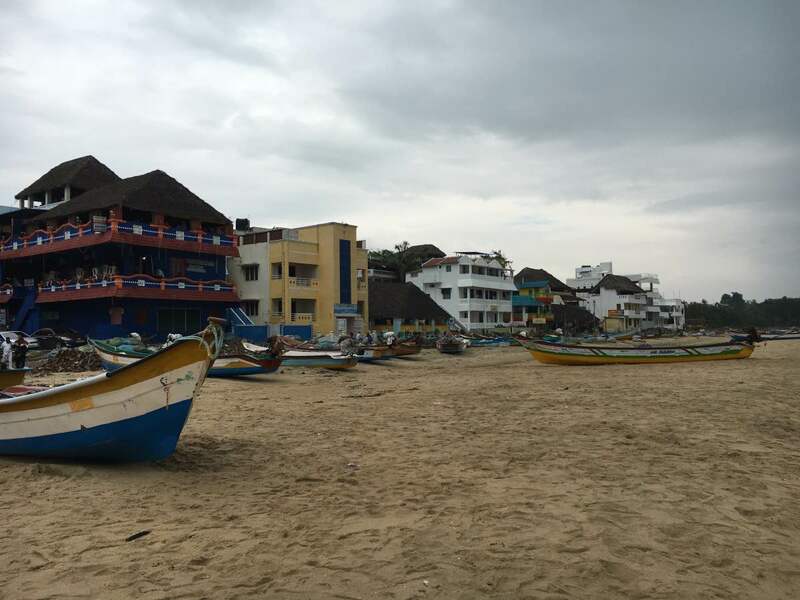 Close to the temples is Mamallapuram Beach and the small town which is ideal to have a wander around. The beach is relatively clean by Indian standards and nice for a short walk. The waves are very treacherous however, so it’s not ideal for swimming. 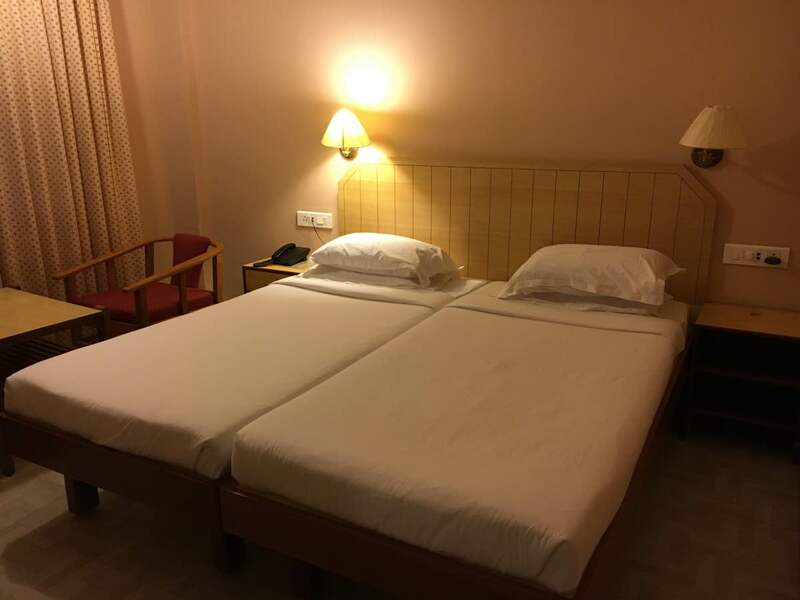 Budget – Rajalakshmi Guest House – 1 minute to the beach, clean and comfortable from $10US per night! As we were on a food tour, we had a private lunch in a local fisherman’s home. 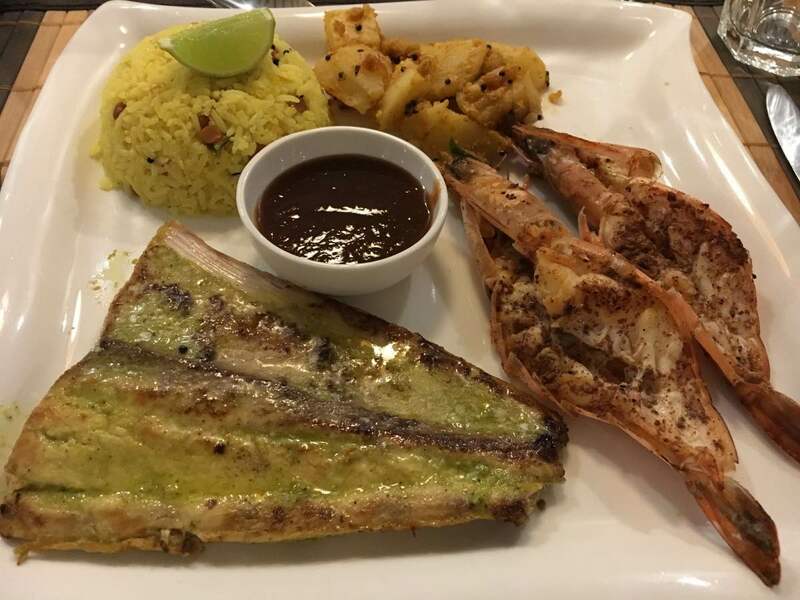 However there are a number of rooftop restaurants in the area all serving delicious fresh fish curry and other seafood dishes. Chennai is the largest city in Tamil Nadu and is also known as the Detroit of India thanks to much of the car manufacturing there. 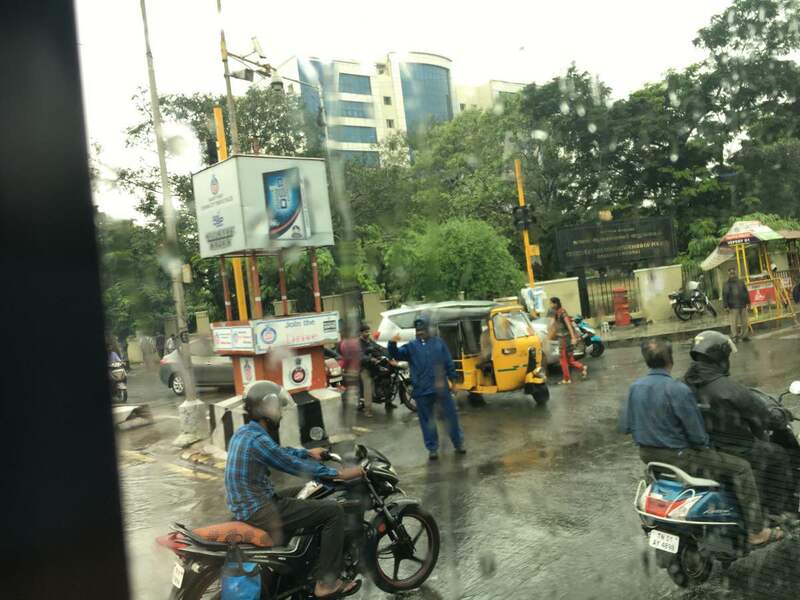 It’s quite a well-ordered city by Indian standards – however when I arrived it was absolutely flooded thanks to a nearby cyclone that deluged the city. This museum of history and culture is the second oldest in India, and home to an impressive collection of archaeological collections. It also houses the largest collection of Roman antiquities outside of Europe, so is well worth a look. 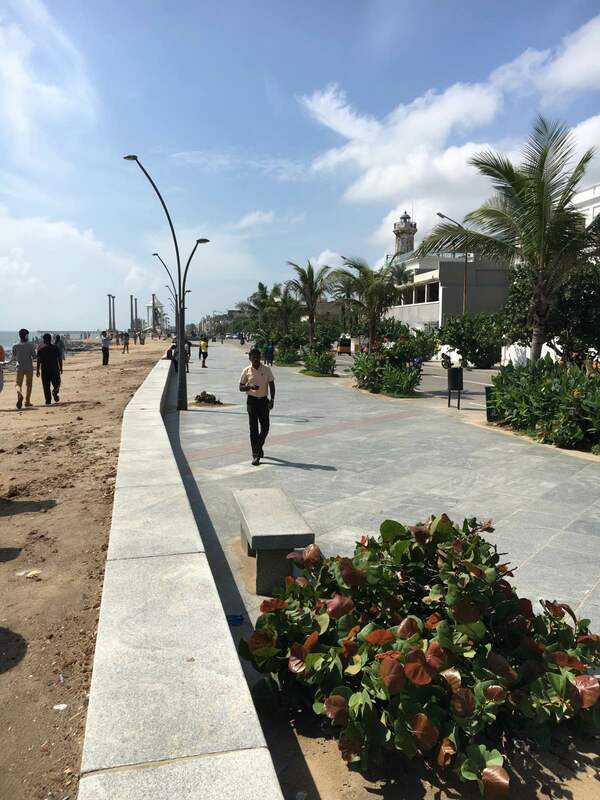 This almost 7km long beach is the largest natural urban beach in the world, and is a defining landmark of Chennai. There’s lots of seaside attractions and street food on offer along the promenade, as well ladies selling freshly caught fish on the pavement. The beach is too dangerous for swimming – it’s actually legally banned due to the strong currents. It’s a great place to stroll, but busy with an average of 30,000 visitors per weekday and can get up to 2 million people per day in the summer months! Often non-Hindu are not allowed to visit inside the sanctum sanctorum (a shrine inside the temple where the main deity is installed) so always check, and dress modestly. I stayed at the Pride Hotel in Chennai. The rooms were nice, clean, good WiFi and the in-house hotel restaurant was fine. Breakfast was a mix of Western and Indian food and there was decent coffee! I’d happily recommend it as a good mid-range hotel. Find out more about the Pride Hotel and book here. 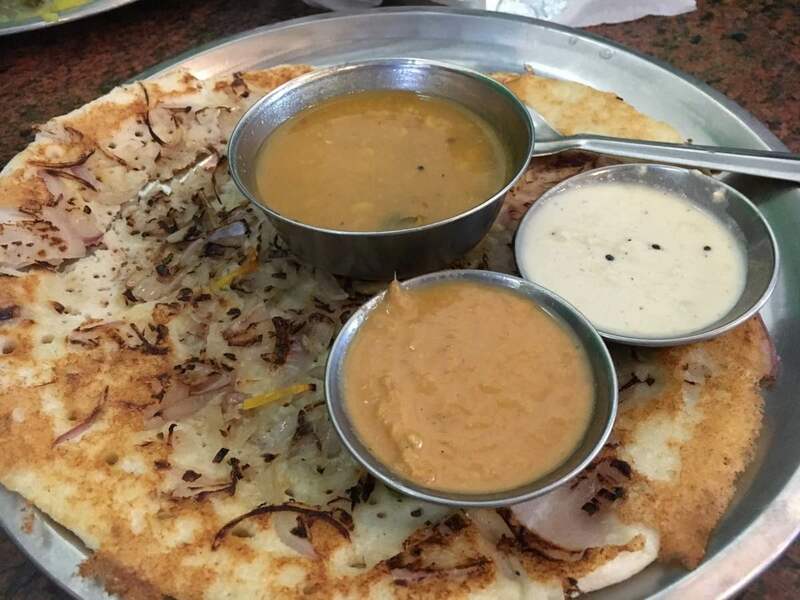 Masala dosa is classic Southern Indian cuisine and you must try one in Chennai. Mine was perfectly crisp yet light and was stuffed with delicious potato and egg. Heaven on a plate. 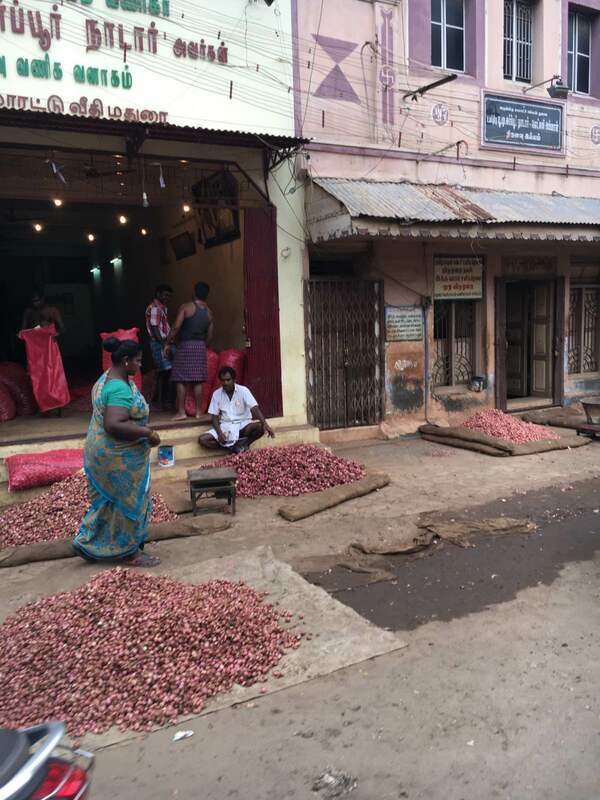 Tamil Nadu was an incredible adventure, and it was fabulous to experience a completely different side of India than the well-worn tourist path of Rajasthan. 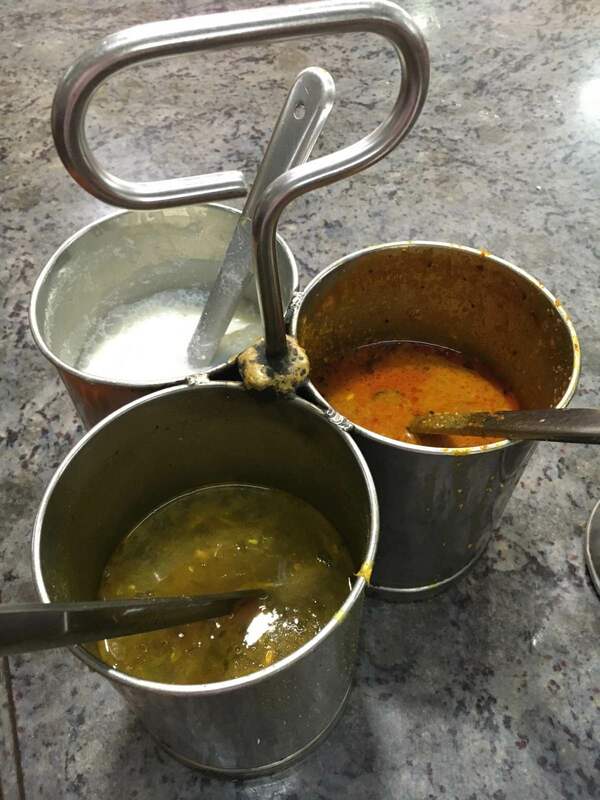 The food was incredible and the people very friendly, I found it to be mostly hassle free. 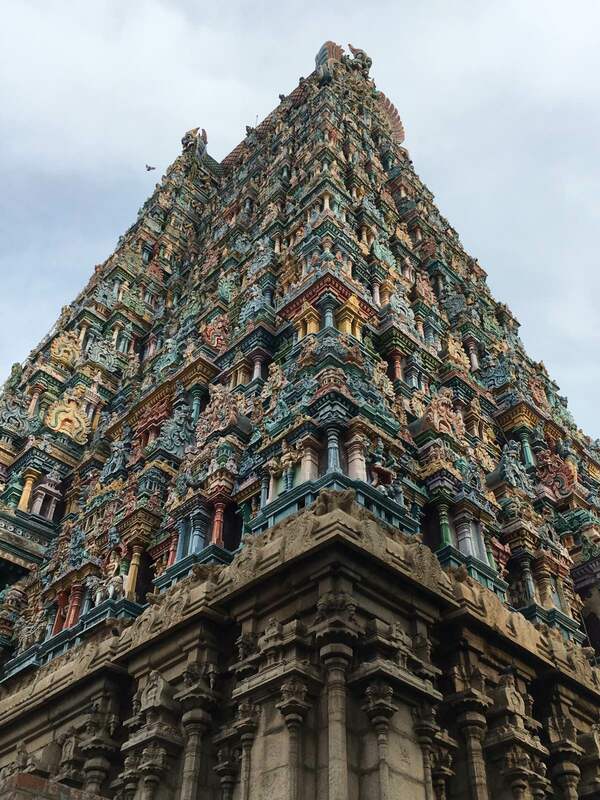 The temples are absolutely mind-blowing and should definitely be on your bucket list!